Syria's national security chief has died from injuries he received in an attack in Damascus on Wednesday, state TV has announced. Hisham Ikhtiar is the fourth high-ranking official killed by the bombing at the national security bureau. 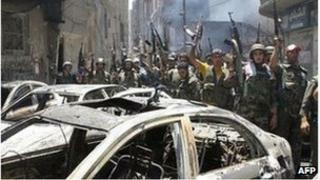 Clashes have continued in Damascus, with the military repelling a rebel assault in the Midan area of the city. Meanwhile, Russia's envoy to France has sparked a row after saying President Bashar al-Assad was ready to step down. Alexander Orlov said Mr Assad had, in effect, agreed to step down last month at a conference in Geneva which had planned for a democratic transition. "Assad nominated his representative to lead the negotiations with the opposition for this transition. That means he accepted to leave, but in a civilised way," said Mr Orlov. His comments triggered an angry response from Syria, where the information ministry said the claims were completely baseless. Syrian official TV said a state funeral was held in Damascus for the three men, and that there was a big official turnout for the occasion. However, the report did not mention whether Mr Assad attended, and no pictures have so far been shown, itself a clear sign of extraordinary times, says the BBC's Jim Muir in neighbouring Lebanon. The attack at the National Security Bureau came shortly after rebels declared an all-out assault on the capital, calling it Operation Damascus Volcano. Eruptions of violence have been seen across the city since Sunday. In the latest fighting, state media announced the area of Midan had been "cleaned" of "terrorists". Rebels said they had withdrawn from Midan after coming under bombardment. Journalists were allowed into Midan on Friday, and pictures showed dust-covered corpses lying in the streets, with tanks and burnt-out cars littering the area. But elsewhere in the country rebel fighters managed to seize control of several border posts late on Thursday. The rebels attacked crossings both on the southern frontier with Iraq and the northern border with Turkey. Government forces have been trying to retake some of the areas since, and it is unclear who is in control of the borders. The UN's refugee agency says it is receiving reports of between 8,500 and 30,000 people fleeing across the border into Lebanon over the past 48 hours. Other reports suggested more than 3,000 had crossed into Iraq in the past day. Activists said more than 300 people were killed on Thursday, making it the bloodiest day since protests against Mr Assad began in March last year. Some 16,000 are estimated to have died in the past 16 months.